The Deuter Kid Comfort 3 is a high-quality backpack carrier for little ones. This pack is highly adjustable with a contoured, breathable back pad and a torso range adjustment of 5.5 inches. The padded shoulder straps and waistbelt are nicely structured and offer additional support for overall comfort. The cockpit provides a cozy, close, secure feel with firm seat, padded harness, and angled soft headrest with removable drool cover. We liked the variety of storage features that include the dual waistband pockets, three back pockets, dual water bottle holders, and a pocket for a hydration bladder. This pack is heavy and a little more expensive than most of the products in this review. However, it has a lot to offer for both the wearer and the passenger, and we think most parents will like what it has to offer. The Deuter Kid Comfort 3 is a high-end pack with lots of features and great storage. Hans Deuter started the Deuter company in 1898 by supplying the Bavarian Royal Mail with mail bags. They move on to sailcloth, and horse blanket manufacturing and by 1905 the company was making tents and renting them out, and by 1910, the army commissioned Deuter to create saddlebags. In 1968, Deuter produced the first nylon backpack which soon became the norm for this kind of product and in 1970, Deuter is recognized by Germany as the leading manufacturer of backpacks and bags. Deuter employs mountaineers, mountain guides, and bikers in 1988 to influence the products they will be using, and by the 1990s they develop the bike backpack. In 2001, Deuter opened a USA subsidiary. This chart is a comparison of the overall scores for each backpack we tested in this review including the Deuter (blue). The sections below include details on the Deuter's performance during testing compared to the competition. We feel the Deuter is one of the most comfortable options for the wearer. The Deuter earned an 8 of 10 for parent comfort. The back of the Deuter has padded and contoured sections that increase comfort and make the pack easier to fit for wearers of different sizes. This pack has a padded back pad with spaces for air flow and a contoured design that improves overall comfort. 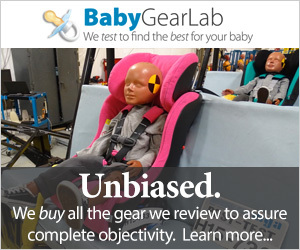 The pack sits close to the wearer with a tight cockpit that positions baby's weight closer to the wearer. The shoulder straps are well padded with more structure that helps distribute baby's weight. The torso adjustment of the Deuter is easy to use, but finding it under the lumbar support can be tricky the first time or two. The torso adjustment works well with a range of 5.5 inches. The strap is located under the lumbar support pad making it harder to access, but the greater range helps the pack fit better. The Deuter waistband is structured and highly adjustable making it more comfortable for the wearer while hiking. The waistband of the Deuter is firm, comfortable, and well padded. The buckle opens one-handed, and the straps move smoothly in a forward motion that operates while wearing the pack. The Deuter has a secure and snug cockpit with a firm seat pad that offers better support than the competition. The Deuter earned a 9 of 10 for child comfort. This score is the second highest for child comfort in the group. The Deuter has a side opening with an easy to use buckle that helps keep little ones snuggly enclosed and not flopping around. This pack has a snug cockpit with a firm seat that doesn't fold under baby's weight. The passenger doesn't flop around like some of the lower scoring options we tested giving little ones a secure overall feeling. This pack has a face rest with a drool pad for comfortable napping. The face rest is removable (above left) and covers the adjustment buckle for the seat height (above right). The face rest/drool pad is removable for easy cleaning and for access to the seat pad height adjustment. The face rest is angled and creates a good place for baby to rest their head unlike the vertical pads in some of the competition. It is covered in soft breathable material and angles up on the sides to prevent little heads from being unsupported. The Deuter stirrups have a clip attachment that is height adjustable for finding the most comfortable fit. This pack has stirrups to prevent feet from awkwardly dangling. The stirrups are removable and adjustable with a loop for resting the foot. The buckle and height strap work well and are adjustable while wearing the pack. The Deuter canopy deploys from a top pocket and connects via clip in the front. While this canopy isn't the best in the wind, it is good for sun and rain with better visibility than the competition. The Deuter has a canopy that deploys from a small pocket at the top of the pack. It provides some protection from the elements and has good visibility but it isn't the best for wind protection. The variety of adjustments on the Deuter makes it a little harder to use than the some of the competition. The Deuter earned a 6 of 10 for ease of use. The harness shoulder straps are easy to adjust and can be done with baby in the carrier. The passenger harness adjusts by lifting the Velcro behind the back padding and pulling up or down. The seat height adjustment is located under the face pad and can be raised or lowered easily once you get the hang of it and both can be done with baby in the carrier. The Deuter shoulder straps (above left) has an easy adjustment that moves smoothly even on the fly. The waistband is a forward pull and the buckles can be used one-handed. The chest clip (above right) helps draw the cockpit forward and closer to the wearer and can be operated with one hand on the go. The majority of storage pockets are on the back of the Deuter out of reach of the wearer. The Deuter earned an 8 of 10 for storage. The Deuter main storage pocket is easy to access, and the zipper runs smoothly. It is big enough for a jacket, diapers, travel sized wipes, and snacks. The zipper runs across the top and both sides creating a very wide opening (above left) so it is easier to find what you are looking for without digging your hand deep into the pocket (above right). The Deuter has a flat pocket on the back of the carrier where you can fit thinner items like maps, guide books, or diapers. There is a flat pocket on the back of the pack with an elastic top that has a strap and clip to keep your belongings secure. It can hold diapers and wipes but is better suited to maps and thin items. The smaller zippered back pocket on the Deuter has a key clip and is good for smaller items. There is an additional zippered pocket on the back of the pack for smaller items. This pocket piggybacks the pouch mentioned above and is narrow and deep but flat and will not hold bulky items. There are two stretchy side pockets that hold water bottles, but neither the adult nor the child can reach these pockets when the pack is on. The Deuter is one of the few options that will hold a mobile phone in the waistband pocket. While it may not hold a larger phone, most standard sizes should fit. The waistband also has storage with two medium-sized pockets that are deep, wide, and easy to open. One pocket can fit two granola bars and a small to medium sized mobile phone and the other carries a small mirror that is attached to a Velcro strip so you can see your passenger while hiking. This pack is hydration ready with an insulated pocket between the child and parent and a straw port with a loop on the right shoulder strap. The pocket has a side zip access but there doesn't seem to be a place for securing the bladder to the bag. As a result, the bladder may want to settle to the bottom of the pocket.